In last Wednesdayâ€™s â€œThanos Snaps, Retail DisappearsðŸ‘¿,â€� we included a LOOOOOONG list of retailers that are shutting down stores. Subsequently, J.Crew Group announced that it is closing a net 10 stores (20 J.Crew locations offset by 10 Madewell openings), Williams-Sonoma Inc. ($WSM) announced that it plans to close a net total of 30 stores, Hibbett Sports Inc. ($HIBB) announced approximately 95 stores will close this year, and Tommy Hilfiger closed its global flagship store on Fifth Avenue (Query: is New York City f*cked?) and its Collins Avenue store in Miami. The point of the piece, however, wasnâ€™t to wallow in retail carnage: rather, it was to make the point that thereâ€™s no way the malls â€” or at least certain malls â€” could continue business as usual. * With thousands of stores coming offline, we argued, there have to be malls that start feeling the pain and, eventually, run afoul of their lenders. We used $CBL as our poster child and closed by stating that Canyon Partners was shorting mall-focused CMBS via a CDS index, the Markit CMBX.BBB- (and lower indices). Citing the bank's recent review of potential areas of financial imbalance across the US corporate and household sectors, [the Goldman analyst] notes that stretched CRE valuations ranked near the top in terms of risk level; and while a large and immediate commercial property price downturn is not the bank's baseline forecast, "a scenario with falling commercial property prices in the next 1-2 years is one to which we would attach non-negligible probability" the analysts caution. It is far from certain that all of this noise about shorting CMBS is anything more than isolated trades. One thing that is certain? Zerohedge is better at drumming up fear than Jordan Peele. We think the company continues to face significant headwinds to turn around operations which havenâ€™t meaningfully improved since the J Crew brand relaunch in 2018. These threats include fast fashion and online retail, as well as continued declines in mall traffic and greater price transparency across the apparel industry. We believe these trends are especially heightened for U.S. mid-priced apparel retail players as consumers shift apparel spending toward brands with a consistent customer message or more appealing prices, given the continued preference for value, freshness, and convenience. Tell us how you really feel, S&P. Speaking of damning assessments, there was this flamethrower of a press release issued by Legion Partners Holdings LLC, Macellum Advisors GP LLC, and Ancora Advisors LLC regarding Bed Bath & Beyond Inc. ($BBBY). Burn, baby, burn. 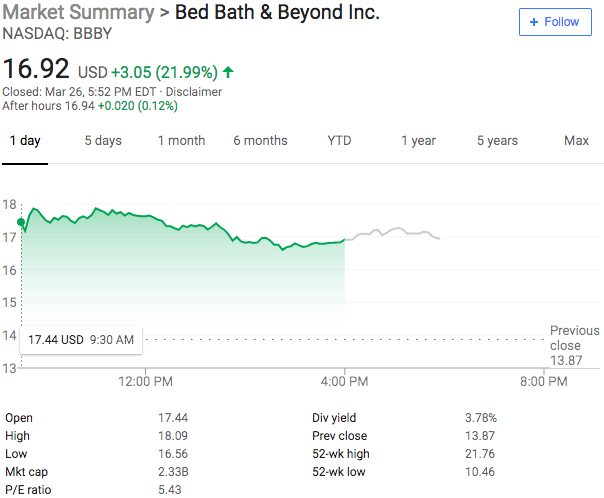 Bed Bath & Beyond swam against the retail tide last week as the companyâ€™s stock showed huge gains after it said that it is ahead of its long-term plan and that it is successfully slowing down declines in operating profit and net earnings per share. Which is interesting because, putting forward guidance aside, the ACTUAL numbers werenâ€™t all that great. In fact, the companyâ€™s trend of disappointing same-store sales continues unabated (negative 1.8%, worse than forecast). EPS and revenue numbers were slightly better and slightly worse, respectively, than expected. Which means that to drive the higher EPS, the company must be taking costs out of the business. We have no crystal ball and this is in now way meant to be construed as investment advice, but weâ€™re not seeing justification for a massive stock price increase (up 15% from when we wrote about it and 30% from its December 24 low). Certainly not mincing words there, thatâ€™s for sure. Failed retail execution and strategy. Apparent inability to prioritize a long list of poorly implemented initiatives and managementâ€™s lack of success in adapting its business model to a changing retail landscape, has resulted in stagnant sales and adjusted EBITDA margins declining from 18% in fiscal 2012 to 7% in the last 12-month period ending November 2018. Deeply entrenched board lacking retail experience is an impediment to serving shareholder interests. Average director tenure is approximately 19 years and the lack of retail expertise and stale perspectives on the board have hindered proper oversight of the management team. We meanâ€¦those are just cold. Hard. Facts. And theyâ€™re not wrong about the board: it strains credulity to think that the Head of the TIAA Institute, a pensioned partner at Proskauer Rose LLP, and an EVP for Verizon Communications Inc. know f*ck all about the travails afflicting retail these days (to be fair: it seems the founder and CEO of Red Antler, a reputable branding agency that has helped build the likes of Casper, Keeps, Boxed, Google, allbirds and Birchbox makes senseâ€¦if anything has value hereâ€¦and, yes, weâ€™re REALLY stretching hereâ€¦its the, gulp, brandâ€¦like, maybe? ?â€¦or, like, maybe not???). Problematically, however, the three firms own merely 5% of the outstanding common stock so thereâ€™s not a ton that they can do to agitate for change. The market, though, doesnâ€™t seem to give a sh*t: it just wants somethingâ€¦anythingâ€¦to happen with this business. More significantly, investors simply cannot sit on the sidelines anymore and watch retail management teams flail in the wind. We discussed certain management teams that really seem to be skating to where the puck is going, see, e.g., $PLCE. But many others arenâ€™t and those that arenâ€™t act at their own peril. Here, at least, investors are putting management and the board of directors on notice. Expect to see other investors act similarly in other cases. *There are a number of malls, however, that do seem to be continuing business as usual. This piece makes the point that apocalypse is not as bad as the media makes out.